The vg23 is a 23 foot sailboat constructed of a plywood-fiberglass-epoxy composite, also known as stitch and glue. 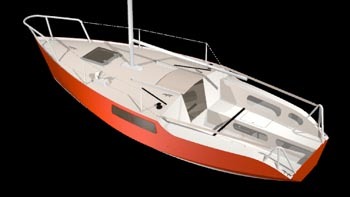 I bought the plans for this sailboat from boatplans-online.com this past winter and began construction in the spring. I’ll blog about the building progress in posts to follow, but for now let me introduce you to the design a little bit more. offshore capable, well balanced fast hull that is easy on her crew, seaworthiness and strength but we were able to blend those qualities with better speed, more room, easier building and more strength. What I really like about this design is the size – still relatively easy to trailer while being large enough for an extended cruise. As well, the shallow draft of the centerboard and keel is a big plus. I should be able to take her pretty much anywhere. I am not a skilled carpenter, let alone boatbuilder, so the building method is also quite appealing. I can tell you this is one of the best things I’ve ever done. It’s looking good so far! 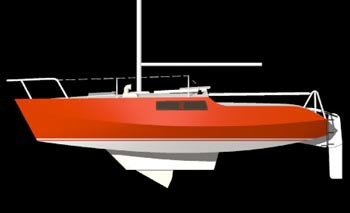 I’m starting my own VG23 project down in the maritimes and I am looking for a good source for materials. Where did you get your materials? Awesome! Where abouts are you located? I’ve spent a fair bit of time on the south shore of Nova Scotia. Liverpool to be exact. I ordered wood from Noah’s marine who have a Canadian outlet in Toronto. I found buying fibreglass and resin to be cheaper in the US – even with UPS brokerage fees. Until two weeks ago I thought that owning a boat of this quality was beyond my expectations. After looking at the tutorial on Stitch & Glue at http://bateau2.com I decided that it was possible and affordable. I will be watching your progress with great interest. My plans are to start this project after I retire next year. Please post lots of photos. Steve, you will not regret it! If I’m able to pull this off anyone can. Be sure to let us know how things go with your project. Hey, Andrew! We conversed a little less than a year ago about your VG23 and I am glad to see you started your blog. I am intersted in following your progress on the 23 because I also intend to build one starting hopefully this year. I really fell in love with “Just Right” of Justin Pipkorns read his entire site and read Devlin’s book as he suggested. I even ordered the plans for the 20. But it was just not quite what I was looking for. I was wanting a little more amenities in the cabin area and a little larger trailerable boat. I reviewed the “Serpentaire” at the French sites and liked the 7.5. I also began to gain interest in the VG23 and after reviewing your start up have decided that I will build the 23 with some modifications in the cabin. I hope to be retiring in about 4-5 years and am looking forward to some coastal cruising after I learn to sail. Have you noticed that the extra cabin room is actually a 2 foot extension of the beds under the crew seating? The main cabin area is still 6 feet. I kept staring at the drawings and it finally occurred to me what I was missisng. An eight foot crew cabin would have been really nice. I seem to recall a small discussion on the bateau.com messageboard regarding extending the cabin to frame g. Unfortunately, I can’t seem to find it. Personally, I kind of like the large cockpit. What is the ‘head’ area in this boat like? Is there any room for a shower pan? It has been a long time since the last reply in June 2006 and since then this thread seems to have died out. A pity. Hope this reply will help to wake it up from the dead. So how’s your VG23 project getting on? I’m going to start mine soon. I’m looking forward to following your project so be sure to keep that site of yours updated as you build. Is your boat finished? If so, could you contact me via e-mail? I am interested in building one, but need some further information from someone who has done it.